I found this one by chance when church crawling in the Vale of The White Horse, near Uffington, the territory of William Morris, John Betjeman and John Piper. St John the Baptist is a small 12th century church, allegedly founded in response to pagan worship on nearby White Horse Hill. The interior was largely untouched by the Victorians and it has recently had a thorough restoration. There are relatively large areas of 14th century wall paintings, 15th - 17th century woodwork and an interesting selection of stained glass windows. Detail of wall painting, lovely colours from the stained glass on the edge of right hand photo. I'm getting better at guessing the makers of 19th century stained glass, but there is no need in this church. The obviously interesting window with the arts & crafts style red sky (below left) and foliage has a very legible makers' name handwritten in a way you don't often see (below right) under the title, as if it's a line in an exercise book. 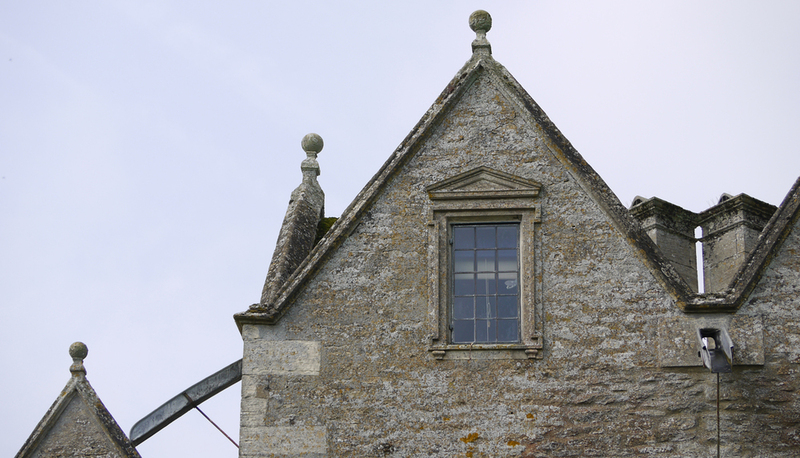 Next, at the belfry end of the church, there appeared to be a smallish Kempe window (below left). There is the general greeny yellowness of the glass and the peacock feather wings, but I mostly identify Charles Eamer Kempe windows by the facial features of, in this case, the three saints. I was very pleased to see his identifying maker's symbol in the bottom left of the window - a castle in a wheat sheaf (below right). C.E. Kempe window and detail from bottom left panel with the identifying mark. There are two fragmentary windows to the right of the altar, shown up beautifully on a dull day with soft light and trees as a backdrop. I would say the green man in silverstain is medieval glass. The other is a piece of painted and etched glass patched together, showing a crest with a fabulously easy latin motto: VIRTUS IN ACTIONE CONSISTIT. The date of this one is, for me, hard to guess.